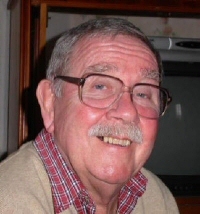 Spike Heatley was born in north London on February 17, 1933. The nickname derives from early adoption of a crew cut hairstyle. 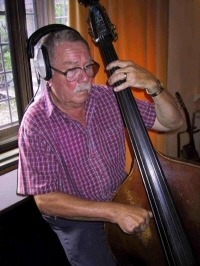 He first fell for jazz on the radio, 'dabbling with an e-flat clarinet but all along I had this craving for the double bass… London jazz life in the 1950s is clearly a subject dear to his heart. Soho in those days was like a village. There were little drinking clubs tucked away, discreet places open in the afternoons, where there was always a piano player or a guitarist. If you walked in with an instrument, you'd be welcomed with open arms, given a drink and you played. That's where so many of us learned our trades. And you got heard by other people. 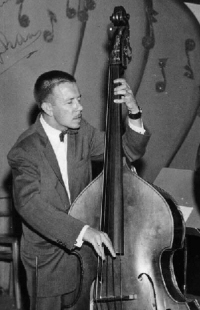 Heatley was with pianist Eddie Thompson's house trio for the opening year at the original Ronnie Scott's in Gerrard Street, while also playing the Sunday night spot with John Dankworth. At the Marquee in Oxford Street one night, Count Basie saxophonist Frank Foster dropped in. We played "Cherokee" at a hell of a lick, and Frank kept making encouraging remarks. I think that convinced John to have me in his big band. The following Q&A occurred in June 2006 with the hospitable cooperation of Spike Heatley. T.A. : Hello Spike. I wonder if you would answer a few questions regarding your memories, if any, of Blues Incorporated? I realize this is a long time ago. Spike: Hi Todd, happy to help out if I can - though my memories of that period are rather blurred round the edges. T.A. : It is common knowledge that Alexis wanted seasoned professionals for the recording of Blues Inc.'s all important first album, R&B From The Marquee. You were playing with John Dankworth at that time? Drummer Graham Burbidge, who also played on the album, was quoted as saying Spike Heatley made me more jazzy where I would have been more stark, angular and bluesy. But Spike was playing this wonderful, modern, rolling bass and on the album. I was caught between two stools. Spike: I was doing so many different things all at the same time, I remember that Graham was the drummer with Chris Barber and I also remember that dear Cyril always had a harmonica in one pocket and a quarter bottle of scotch in the other which he was always ready to offer me a "snort" from. Alexis had organized a weekly gig in Ealing Broadway and of course as you may well know, Charlie Watts was the drummer with us and Mick Jagger came to sit in with us quite often and I believe that was the start of the Rolling Stones. Alexis ... he was always very much involved in the jazz world, doing quite a lot of radio work for the BBC, eventually he helped create the CCS big band with MD John Cameron whom I had helped get started in the music business…a very talented guy I must say but I believe this was rather later, perhaps the very late sixties or early seventies. But I do remember that we recorded Whole Lot of Loving for the BBC as the signature tune for their program Top of the Pops. T.A. : You mentioned the Ealing; did you ever happen by, or jam at The Roundhouse in Soho? Spike: I've never played the Roundhouse. T.A. : Would you comment on the musical direction / style of Blues Inc. and perhaps on the musical abilities of Alexis & Cyril? Were you impressed? 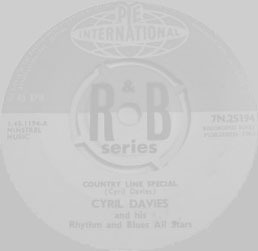 Spike: Alexis and Cyril were both very enthusiastic musicians and suited the style but were not what you might call virtuosos; but they didn't have to be. However they both had a certain charisma. T.A. : The whole concept, I think, was not to have a permanent rhythm section. To that end, were you familiar with the other bass players on the Blues Inc. scene(? ); i.e. Malcolm Cecil, Andy Hoogenboom, Teddy Wadmore and Jack Bruce, etc -or drummers - any comments? Spike: I knew all the bass men you mention except Hoogenboom, is this a joke name? I've never heard of him. Teddy is long retired and may not be around anymore, Malcolm lives in the USA where he is a very successful sound engineer and Jack AS YOU MUST KNOW was with CREAM with Eric Clapton and Pete Baker. T.A. : I'm sure you have a million stories to tell regarding all the amazing people you played with and the life experiences you've shared. May I ask what prompted your move to France? Spike: During the 1980s and early 90s, I was lucky enough to have three main jazz gigs running concurrently via the same manager as well as my own quartet; firstly with the American all star group the Great Guitars featuring Herb Ellis, Charlie Byrd and the great Barney Kessel also sometimes featuring a wonderful British player, Martin Taylor. All our work was in Europe at that time and of course in USA they had another rhythm section. Then for quite some time I was with Barney's trio along with my drummer (for the last 25 years, Mal Mortimore, then he and I were again together with a wonderful Canadian pianist, Oliver Jones. Eventually, Oliver decided he had finished with touring and returned home. Barney returned to San Diego and was taken ill with a massive stroke from which he eventually died some nine or ten years later. I decided that I needed a break from touring - decided to come to France to live and gradually wound down my obligations until I had finally retired. But Martin Taylor came to France and insisted that I start to play again after some 7 or 8 years so here I am back on the roundabout with another quartet but still the same drummer! He, interestingly enough, plays also in a blues group with Chris Jagger, Mick`s brother. Next, I played some gigs apart from the recording session but gradually drifted well but away as I had many other irons in the fire. T.A. : Thank you Spike for your time and consideration. It would be great to hear from you again! Spike: My memory is rather vague apropos that period, I wish you well with your project. Thank you for contacting me, all the very best!